At the top of Carrubbers Close stands a strange doorway intriguingly marked as “House of Archbishop Spottiswood.” This door is flanked by ornate metal railings which appear at odds with the industrial and ‘functional’ patterns seen elsewhere in the close. The railing to the left of the door appears to be missing a section, which anthropomorphises the otherwise subtle Archbishop’s mitre shape, or perhaps strengthens the underlying phallic symbolism in the design. These are symbols of past use and recent neglect of the Closes, and sit under the word ‘Rebuilt’. This led me to consider the possibility of using the shapes and motifs in the existing railings as building blocks to create new designs, which could act as a simple metaphor for the re-working or re-imaging of the Closes. The resulting works manipulate the original forms to create ambiguous compositions which perhaps hint at present and future narratives of the Close. The forms are re-appropriated with the original meaning lost and left for the frequent cigarette breakers or passing viewer to ponder and decode. 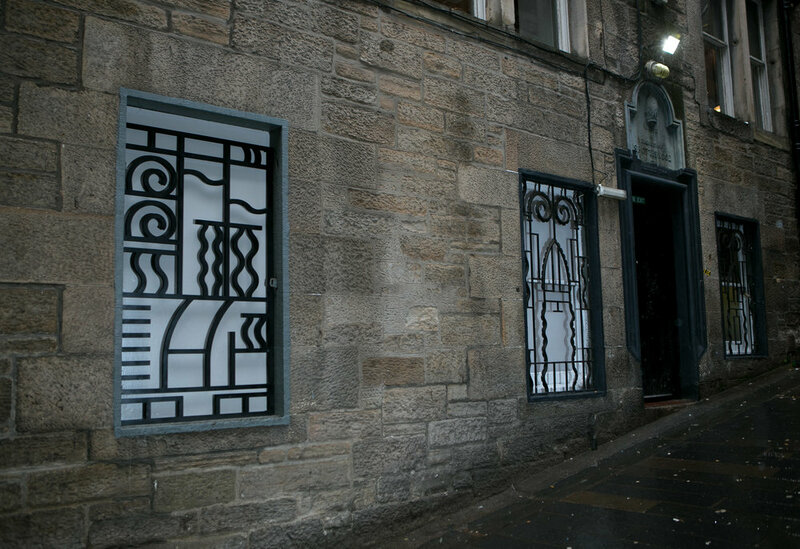 The works are installed in two adjacent blocked windows of the same dimensions slightly further down the close, creating a sequential timeline of sorts which alludes to both the daily and historic transitionary nature of the closes. Additionally, I was particularly drawn to the linear quality of the railings, which informs the design of the Open Close logo, subsequent icons and map.